Since 1914, the gypsy moth has wreaked havoc on Ohio forests. The gypsy moth was originally introduced from Europe to Massachusetts in 1869 in hopes it could be crossed with silkworms. Unfortunately, the results of the attempted cross were escaped moths that would later take over East coast and Midwest forests. What makes this invasive species so destructive is the larvae’s appetite. Once hatched, larvae move toward the tops of trees to feed and grow until they transform into adults. It was estimated in 1995 that almost 35,000 acres of Ohio had been defoliated by gypsy moth caterpillars. Looking into this Gypsy’s crystal ball shows the effects of the moth, which not only include drastic defoliation, but economic losses and environmental degradation, as well. They are literally killing trees and will continue to do so. So, what can be done to combat these hungry, hungry caterpillars? Several programs have been put in place in order to slow the spread of gypsy moth. Such programs include a variety of methods used for eradication. One of the more promising programs is the introduction of a fungus, Entomophaga maimaiga, which targets gypsy moth larvae. 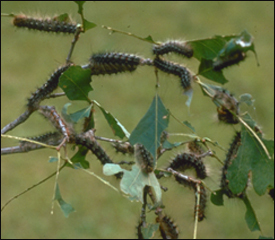 The spread of Entomophaga maimaiga gives hope to Ohio trees as it slows the spread of gypsy moth. by SA Ambrose et al. This is available as an e-book through the OSU Library catalog. For those of use living in the United States, dangerous diseases including malaria and dengue fever might not seem all that important. For those living in areas of South America, Africa, India, and elsewhere, these diseases are threats to everyday life and they are carried by things that they interact with every day: insects. Malaria and Dengue Fever are carried by mosquitoes and these diseases cause over 500,000 deaths (malaria) and 20,000 (dengue) a year. Not only are these diseases deadly and debilitating, they also cost governments and agencies around the world millions of dollars to combat. After decades of control efforts by the World Health Organization and other researchers, many have come to believe that these diseases might be too complex to control. Others have been working to develop a way to genetically modify these disease carriers so that they can control the disease spread. Genetically Modified Mosquitoes have been tested by the company, Oxitec, in various countries around the world.They report that their technique, which includes inserting a gene into male mosquitoes that causes them to require tetracycline, a compound not available in nature to live, caused an 85% reduction in mosquito populations in 4 months. Many speak out against this technology with understandable concerns, including the potential consequences of modifying nature. This becomes less of an issue with other technologies, which do not lead to mosquito death, but instead cause females to become resistant to these pathogens. Others are concerned with how the virus or pathogen will adapt due to less opportunity to infect hosts. Regardless of criticisms, it seems apparent that we should do all we can to control these diseases, while also ensuring that the consequences of our actions have been thoroughly explored. Gluten free is something that we hear about a lot lately. Companies are putting out a lot of new products that claim to be gluten free. Today you can pretty much find anything that has a gluten-free version. There is a big movement right now for a gluten-free diet. My question, though, is this just a fad diet that people are jumping on the bandwagon, and will it go to the wayside in the future? Or is this a trend towards healthier humans. I believe that the gluten free diet is a fad, and in this blog I will explain why I think it is. Before I talk about why I think it is a fad, there is a medical reason to be gluten-free. Some people have celiac disease, an autoimmune disease that attacks the small intestine. Gluten-free diet is best for this disease. It is estimated that 1% of adults in the world have celiac’s. People may have problems digesting gluten. Similar to lactose, it is estimated that 75% of adults have some problem digesting lactose. A majority of this adults though have very little problem with gluten though. One of the biggest claims of a gluten-free diet is that it will help you lose weight, along with other things. I am a big fan of Jimmy Kimmel and recently he did a video where he went out to ask people what gluten was. No one knew what it was they knew where it came from but not what it was (> view video) . I believe this diet fad will only last as long until the next big thing comes around. I’m not a plant specialist. I do however, tend to think that plants are special. When I pass a plant that I believe to be particularly beautiful I think “Wow. What a special plant.” You can imagine springtime is a special time. Each time spring comes around I notice one particular tree. 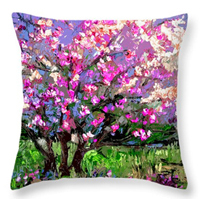 It looks much like the one in the picture – pretty large with striking white and pink flowers. You see, having been a native of Phoenix, AZ (a state whose beauty I consider far superior to Ohio’s), I have always believed that whenever I see an incredible plant in Ohio it must be bad in some non­indigenous sort of way. With the little that I know about plants, one thing that I know is that if a plant is foreign it tends to be damaging to the native environment in one way or another. Imagine my surprise and joy when I bit the bullet and decided to find out the truth behind this tree. I found out that these trees are called Tulip Magnolias and they’ve been here since as early as the 1700s. The best part? This is a perfectly suitable home for them. I guess Ohio may have some things going for it after all!